The next few decades will call for remarkable leadership. As businesses transform themselves for their 21st Century role, they are besieged on all fronts by a "perfect storm” of financial, technical, military, and geopolitical challenges unlike anything seen before. Good leadership is always vital, but in times of crisis and rapid change it can be a game-changing asset. The overwhelming balance of scientific evidence, expert opinion, and organizational experience supports the conclusion that one skill, the ability to influence others, is nothing less than the essence of successful leadership. Only leaders-by-influence will be able to dependably secure needed buy-in, cooperation, and action from the many diverse individuals, teams, units, coalitions, and organizations that make up the business community without using (and, in most cases, without having) direct authority over them. Influencing is a skill that future business leaders must have. There are two ways you can get people to voluntarily do something. You can persuade them (influence them), or you can negotiate with them. The difference between the two is Concessions. Negotiating is the process of getting someone to do something even if they disagree with it, by giving them enough concessions to make it worth their while. Influencers or persuaders give Reasons instead of concessions. This is always faster, easier and more comfortable, and above all cheaper than negotiation. You should always attempt to influence and persuade first before negotiating. The ability to influence others is an extremely powerful skill. In fact, it is a necessary ingredient in professional and personal success. Influencing others requires skill in the following areas: communication, listening, persuasion, assertiveness, negotiation, conflict resolution and problem-solving. The secret to influencing others is to be able to identify behavioral and personality styles and know which style to use when and with whom, and learn how to optimize your chances of having the most influence. The INFLUENCE TO WIN™ Workshop is an intensive two-day program that gives participants the tools and skills they need to adroitly and confidently influence others. 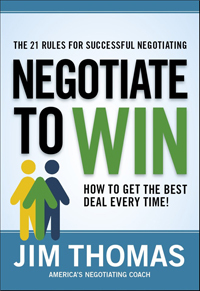 Jim Thomas is the author of Negotiate to WIN®, a Harper Collins international bestseller that has been translated into 18 languages. Jim has conducted the very popular Negotiate to WIN Workshop for 25 years. Because negotiating is one of many influence skills, Negotiate to WIN’s key principles are included in the INFLUENCE TO WIN™ Workshop but make up only a small portion of its content. Before the Workshop, each attendee prepares brief written descriptions of a few "Key Influence Situations.” All participants are given an Influencing Skills and Style Assessment at the beginning of the Workshop to reveal influencing strengths and limitations. The Workshop employs short lectures on the latest influencing best practices, exercises, exploratory discussions, simulations of selected Key Influence Situations contributed by students, video reinforcement, peer feedback, and instructor coaching to develop participants’ influencing skills. Throughout the INFLUENCE TO WIN™ Workshop, each attendee develops (with input from the instructor and their peers) an Influencing Action Plan (IAP)*. By the close of the Workshop, each attendee’s completed IAP will identify specific influence skills needing further enhancement. 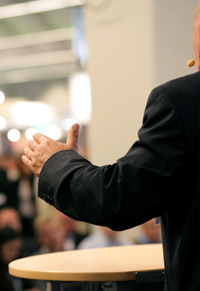 The IAP is shared with the attendee’s manager, who provides feedback, reinforcement, and accountability as the attendee fulfills the IAP. Participants will leave the INFLUENCE TO WIN™ Workshop armed with the knowledge and skills they need to influence effectively. *The Influencing Action Plan is designed to build attendees’ personal influencing strengths by identifying skills that need enhancement and a detailed set of steps (with a timetable for each step) to achieve desired proficiencies. 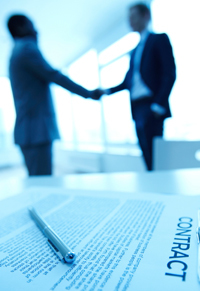 In all aspects of their work with Common Ground, clients are assured of complete confidentiality. Our commitment to discretion and privacy encourages clients to give us access to the information we need to customize INFLUENCE TO WIN™ for maximum participation and learning. Upon request, Common Ground will be pleased to formalize this promise with a Nondisclosure Agreement.